The 1906 San Francisco earthquake struck on April 18 with an estimated magnitude of 7.8. The temblor was followed by major fires that lasted for several days. 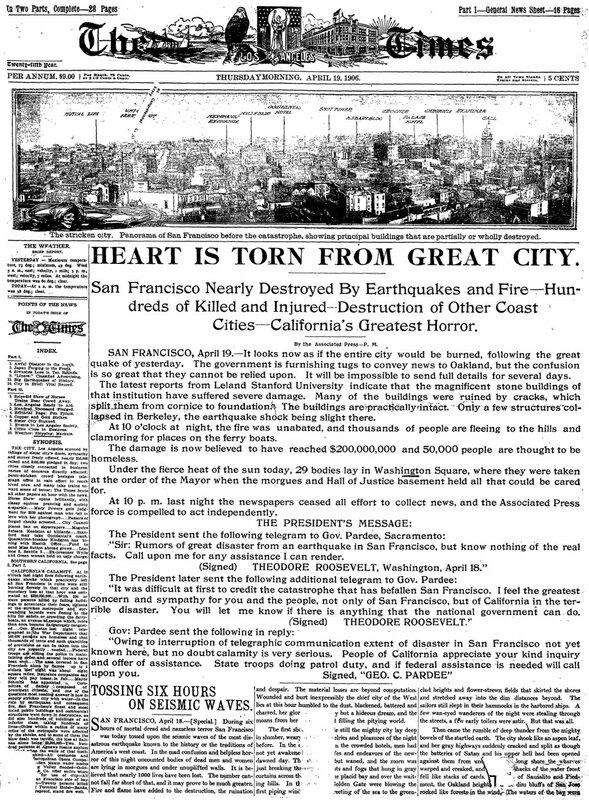 The toll was high, about 3,000 people died and more than 80% of the city of San Francisco was destroyed. The Hibernia Bank building is in ruins following the massive earthquake that devastated the San Francisco area, April 18, 1906. Damage from the 7.8 magnitude earthquake and fire seen along a broad avenue in San Francisco. A quake-spawned chasm cuts through pavement at the corner of 18th and Lexington streets. Cracks and separations in the roadway can be caused by lateral spreading, or the sliding of ground. In the 1994 Northridge earthquake, lateral spreading severed gas lines and triggered huge fires. The aftermath of the earthquake and fire seen from the southwest at the corner of Geary and Mason streets. The remains of San Francisco City Hall after the 1906 earthquake. Sunken area near the Ferry Building on Market Street. April 20, 1906. Downtown San Francisco after the devastation. Massive damage surrounds a building in San Francisco. Smoke billows following the fire that ravaged San Francisco. Undulations as large as 6 feet are seen along Dore Street from Bryant Street toward Brannan Street. At Market and 10th streets, a person looks up at the devastation. Buildings destroyed by earthquake and fire, looking down Montgomery Street at Market Street. A multi-story brick building collapses in downtown San Francisco. A frame house was destroyed in the 1906 San Francisco earthquake. The downtown of San Francisco, in the northeast of the city, was consumed by flames in the great fire that followed the 1906 earthquake. This map of San Francisco drawn for the Army shows the downtown area and wharves after the 1906 earthquake. Lines show boundaries of relief areas, and dots indicate locations of kitchens. Crosshatching shows the burned area (514 blocks). Map shows the extent of the 1906 rupture seen at the surface. The total length is 296 miles (477 kilometers). For comparison, the 1989 Loma Prieta earthquake had a rupture length of about 25 miles (40 km). At left, the Los Angeles Times front page from April 19, 1906 detailing San Francisco's great earthquake and fire. At right, the San Francisco Call newspaper reports on how the flames from the great fire of 1906 headed toward the Ferry Building. The structure ultimately survived. A shopkeeper in San Francisco's devastated Chinatown was already selling souvenirs hours after the great 1906 earthquake hit.